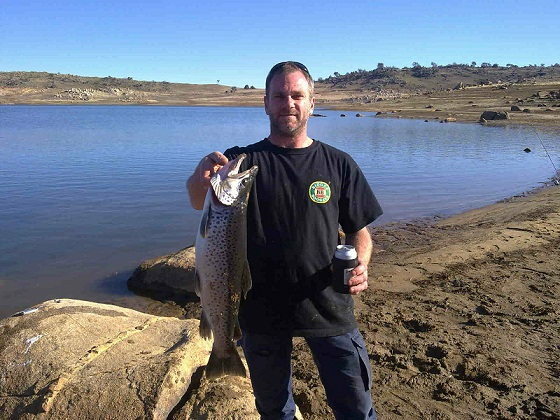 Lake Eucumbene...fishing much the same over the last few weeks with great results down the bottom end of the lake good numbers of browns around the the weedy areas and rainbows down a little deeper. The lake has been a little better in the buckenderra, Rushy's, Middlingbank, seven gates.With a few good rainbows and browns being taken in the evening. 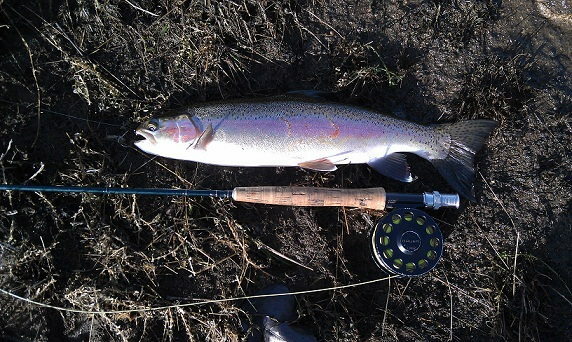 There have been some good browns and rainbows being caught. Most are around the 2lb to 3lb. Fish quality has been excellent. 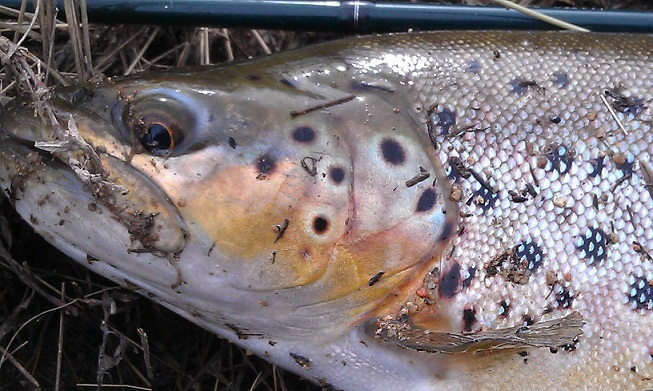 There are still enough of those fat browns around to keep most anglers happy. Fishing is still going well with the lake dropping a little. So start looking for some good drop-offs and weedy areas and count down your fly to see where the fish are sitting this is working very well. Now the winter has come and the river are closed the lake will fish very well this winter with the rainbows feeding well and getting fat.Remember get the wind behind your back you will get better Results.The rainbows are still feeding on midges close to the Banks but remember you must go looking for them you will get better results. I headed up to lake during the week and had a really great session from one to three o'clock. It was overcast and a bit windy but I set up on the shore the wind was coming off at seven gates and there were fish rising and nymphing steadily all around me, within a rod length of the bank. I got a few chases on buggers but no solid takes so I switched to a shaving brush with a #16 pheasant tail hanging underneath on 6 inches of line and had a great session. Plenty of takes casting half a meter in front of rises and three fish banked. Two lovely one and half pound bows and one fantastic four pound (maybe 4 1/2) brown all on the trailing nymph. All fought, jumped like mad and were in great condition. I headed home early satisfied (and late for work!) but I'm sure you could fish all evening for these guys. Lake Jindabyne.....is getting better every week this is the time for great polaroiding around the lake. Jindabyne has been great in the evenings and there is plenty of good polaroiding opportunities when the weather is good. Searching with a woolly bugger will produce a few nice ones or just wander the bank looking for fish and cast a small wet or nymph at any fish found cruising. 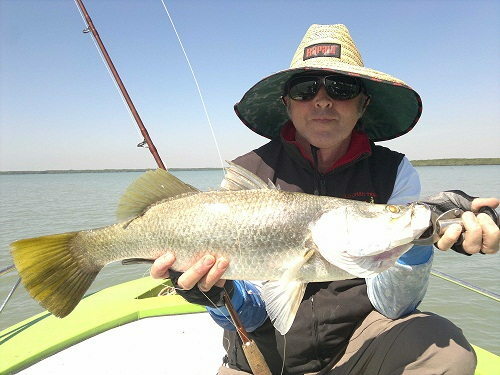 There is still a heap of weed in many of the bays that is drawing the fish in to the food that it holds.With good reports off Brookies and rainbows being caught around Kalkite with Brookies up to 3lb plus.Best areas are the snowy arm, kalkite,poo bay, Best fly_s woolly bugger black, B/H nymphs, remember pick your days and the fishing should be good start walking and you will see some good brown in close.So this is the best time to fish jindy now as it has been very slow for a few month now the reports have been coming in thick and fast it's a good time to see if you can catch one off these Brooke trout before they Disappear. Polaroided Jindy cruiser brought undone by purple fuzzy wuzzy. Set free to enjoy the rest of winter. Luke Despoja. Luke Despoja. Nice well condition bow from the J lake. Released to eat more real midges. 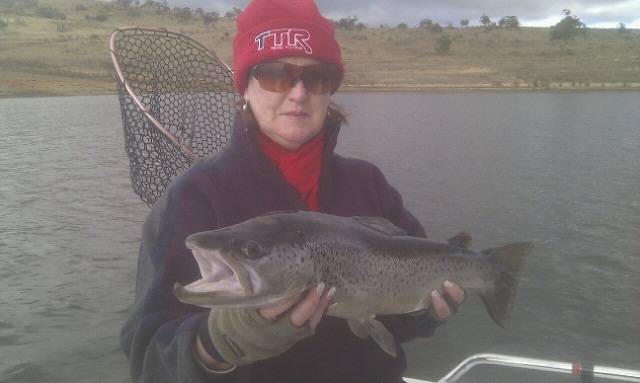 Jindabyne has produced few reports this week. 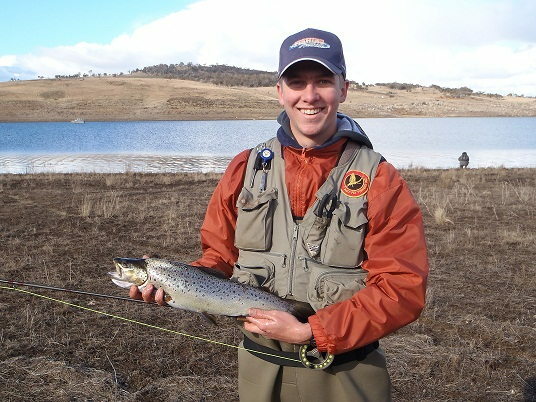 There are still some good fish to be caught in Jindabyne but early starts are the key to catching them. five nice browns this morning all in good nick. 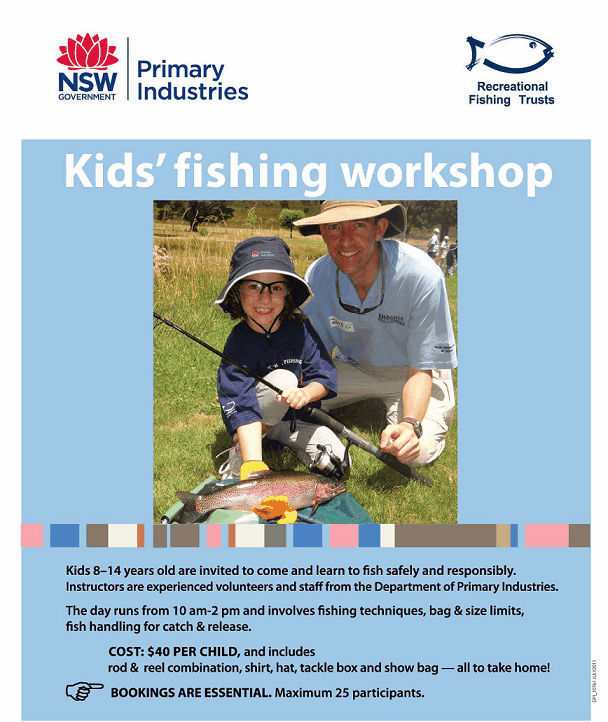 "looks like she out fished her husband again"
We bought some bait from you over the school holidays, and you said if our son caught a fish to email you the pictures, he was very excited when we said it might go up on your website. Please let us know where it will be so we can show him. 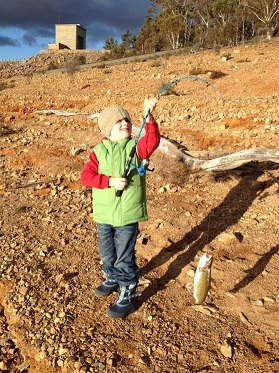 He caught 2 fish on 2 separate occasions, photos attached. What a weekend the wind gusts were up to 45 - 50 kph with plenty of white caps on the lake. The fisherman from the bank done really well with scrub worms as well as chunky cheese and salmon eggs power bait the largest caught was a brown 1.1kg clean with many rainbows in amongst the catch. Trolling, those brave enough to head out in their boats were surprisingly coming back with their bag limits and throwing back a lot more, Peter and Bob told us rapala’s, stuckeys and stump jumpers done very well 14 brown’s and 2 rainbows the largest was a 2.5kg brown and were being caught 12-15ft deep they were full of yabbies, others tried the Tassie devil bomber and caught a 1.3kg and 1.6kg brown. There seem to be a lot of browns caught over the week. That’s it from the team at Buckenderra. base with this message, Cheers.." Trout caught at seven gates in the past at 3pm using chunky cheese"
My Dad (Pekka), a mate (Nick) and myself spent a week down in Buckenderra in early July. We came to the shop and got some of the rapala rainbow trout lures and some Tassies. 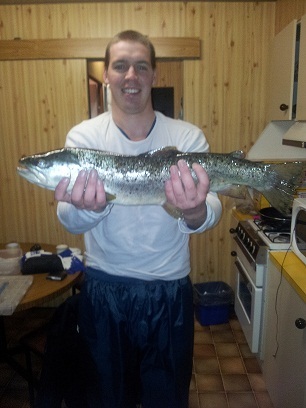 Just sending you through some photos of the bigger fish we caught. 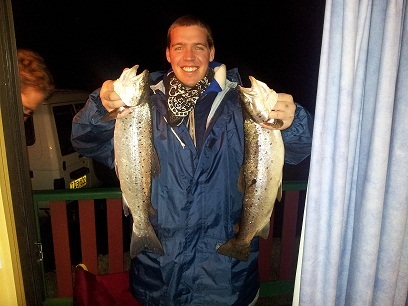 Most of the fish in the photos were caught just on night fall about 20 metres from the shore. 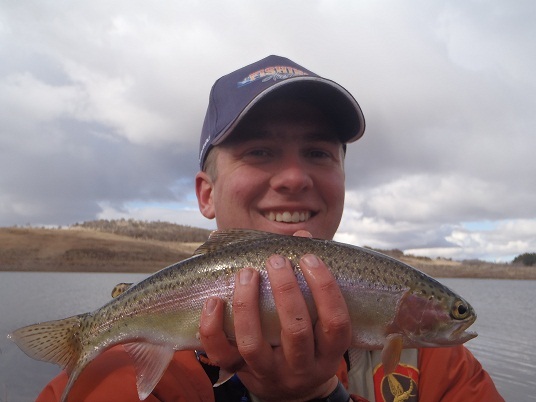 Throughout the week we found that trolled rainbow rapala floaters did most of the damage on the browns, and trolled brown trout rapalas caught the rainbow trout. 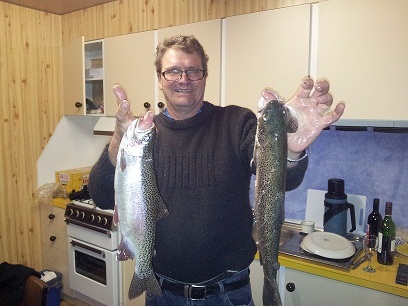 The big rainbow was caught again near shore but on a pink and purple Tassie Devil. See you next year most likely. 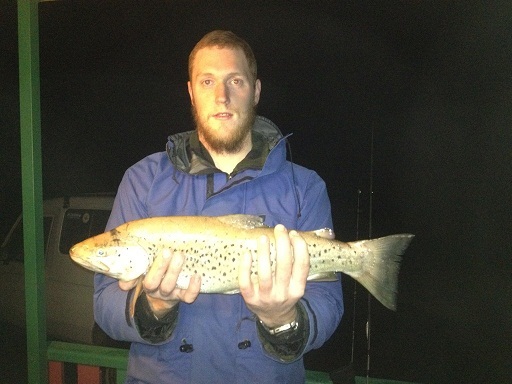 Thanks for all your help getting us on to the big trout. 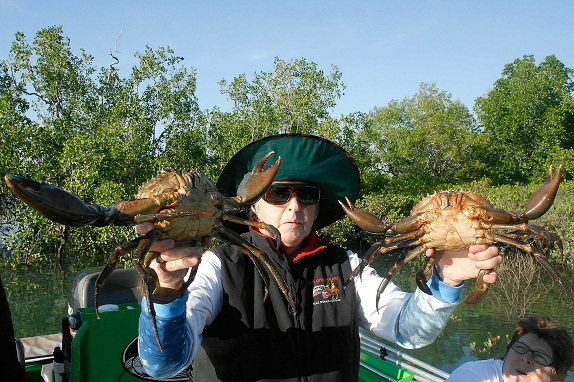 Hi everyone some Photo of us Mud Crabbing And Barra Fishing out Mud Crabbing Darwin Harbour.